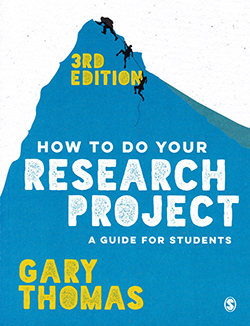 Freelance health sciences researcher Patricia Jarrett reviews How to Do Your Research Project: A Guide for Students (Third edition). This book, which is supported with a companion website, would be helpful for students of social or health sciences at undergraduate, master’s or PhD level. Covering all aspects of the research process from selecting an idea to write up, it includes how to formulate a question, conduct a literature review and obtain ethics approval. The methodology section is clear and provides a detailed description of the philosophical underpinnings of empirical research. The chapter on research designs includes ethnomethodology and action research as well as sampling, quality assessment, research methods and data analysis (both qualitative and quantitative). There are checklists at the end of each chapter and a generous margin at the side of the page for the reader to make notes. The glossary of terms is useful and there are recommendations for further reading. It is easy to read and written with humour. This book would be useful as a stand-alone text as well as the basis for more detailed and advanced reading. I would recommend purchase for library and individual use, although as notes can be made in the margin, individual purchase might be preferable.